never too late to tie the knot. Norah Witkiss was whisked off her feet by Malcolm Yates, 74, when they met at modern sequence dancing. The couple have been together for more than 30 years and will tie the knot next month. 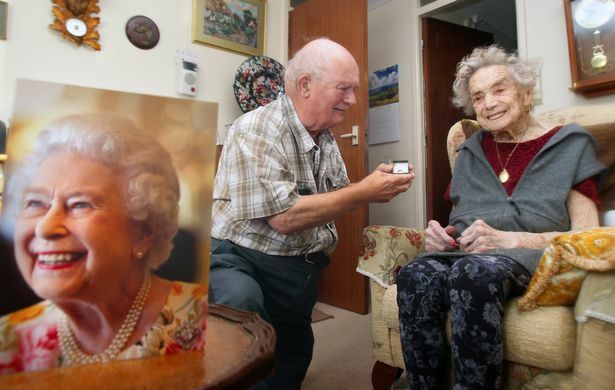 The centenarian from Prestatyn, who turns 101 in December, says she wants to get hitched "before it's too late". She and Mr Yates are set to say "I do" at a ceremony at The Beaches Hotel in the town on October 16. Ms Witkiss, who has been married twice before, said: "Malcolm and I have been together for 30 odd years but have never spoken about getting married. "We just thought we'd get married now before it's too late. "I was worried about me getting older and I didn't want to lose the opportunity. "I'm sure we'll be happy. The retired school cook who ran the kitchen at Ysgol Penmorfa, has got her dress and hat sorted for the ceremony and the couple's wedding rings are on order. Former bus driver, Mr Yates, 74, recalled how they got together. "We met at modern sequence dancing in Meliden. "I couldn't dance, but Norah was very good at it. She more or less taught me and helped bring me on. "We went travelling a lot and would dance on holidays to Torquay. "We liked the Cha-cha-cha the best. "We're always out and about together." The mum-of-one was born in Wrexham in 1917 and married her first husband, Fred Thomas, when she was 18. They met after she was given a green card by the Labour Exchange and was sent to work at the Prestatyn Golf House Hotel as a maid and cook, where he was a golf caddy. After he died in 1970, she met Bert Witkiss and they were married for 16 years. He died in the late 1980s.